Most of us start our day with a bowl of dry cereal. Let's face it, it is so convenient; just open the box and pour. But with the rising prices of commercial dry cereals it is good to have other alternatives. One excellent choice is to make your own Granola. It's so easy to make and you'll love its deliciously sweet flavor and crisp and crunchy texture. Granola always starts with oats, in this case, old fashioned rolled oats. These are oats which are cleaned, toasted, and hulled to become what we call oat groats. If you are wondering what the difference between old-fashioned rolled oats and quick cooking, it is in their thickness. Old fashioned oats are thicker because to make quick-cooking rolled oats the oat groats are first cut into pieces before being steamed and flattened. Although they are usually interchangeable in recipes I recommend using old-fashioned rolled oats in this recipe as I prefer their thicker texture and better flavor. Besides oats, a granola needs nuts and seeds. This recipes uses whole raw almonds along with raw pumpkin and sunflower seeds. Of course, there are many other types of nuts and seeds to choose from, so go ahead and use your favorites. Applesauce is used and you can use either store bought or homemade, and it can be sweetened or unsweetened. Brown rice syrup is also used. Brown Rice Syrup is a natural sweetener made from rice starch. It is tan colored and has a rich and sweet flavor. It is often found in health food stores. However, you can use and equal amount of agave, maple syrup or even golden syrup. For the honey, you can use any flavor, although I like to use a mild flavored honey, ones like clover or orange blossom, because they won't overpower the other flavors in the granola. 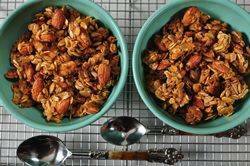 Granola: Preheat your oven to 325 degrees F (165 degrees C). Butter a large baking sheet, or spray with a non stick vegetable spray. In another bowl, stir together the apple sauce, butter (or oil), honey, brown rice syrup, and brown sugar. Pour this mixture over the dry ingredients and toss together, making sure all the dry ingredients are coated with the wet ingredients. Spread in an even layer on your baking sheet and bake for about 40 minutes or until golden brown, stirring occasionally so the mixture browns evenly. (The browner the granola gets (without burning) the crunchier the granola will be.) Remove from oven and place on a wire rack to cool. The granola may still be sticky when it is removed from the oven but it will become crisp and dry as it cools. Stir in dried fruits, if using. Store in an airtight container or plastic bag in the refrigerator. It will keep for several weeks. Serve plain or with milk and fresh fruit. Makes about 5 cups (1.2 liters).